Schematic of the layers and materials used inside the Alexander Signature Luxury Firm mattress. The Alexander Signature Luxury Firm. An affordable alternative to more expensive name brand memory foam beds, combining durable, breathable high density gel memory foam with Nest Bedding's SmartFlow Air Flow Foam and the support of high quality Edge Support Base Foam. Is Alexander Signature Luxury Firm the right bed for you? Based on 85 real owner experiences with this brand. How do people like you rate their Alexander Signature Luxury Firm mattress? Mattresses are personal. Filter the 85 Alexander Signature Luxury Firm ratings by sleep position, weight, age, gender and more to find the ones that are most relevant for you. 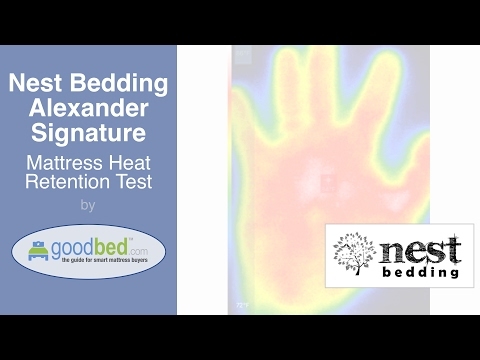 The Nest Bedding Alexander Signature Luxury Firm mattress model is recommended by 80% of owners on GoodBed (based on 85 ratings + 33 reviews). 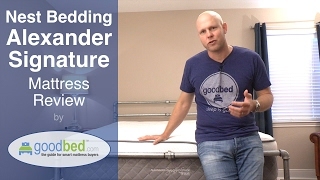 Want more reviews from Alexander Signature Luxury Firm mattress owners? Do you have a Nest Bedding Alexander Signature Luxury Firm mattress? Write a Review! Have a question about the Alexander Signature Luxury Firm? The Alexander Signature Luxury Firm is a euro top foam core medium-firm mattress model released in 2014 that is part of the Alexander Signature Series product line manufactured by Nest Bedding. The Alexander Signature Luxury Firm was previously known as the Alexander Signature Select Firm. Have an update or correction to our information about Nest Bedding Alexander Signature Luxury Firm? If so, please take a moment to suggest an edit. Alexander Signature Luxury Firm mattresses sold by Nest Bedding come with a 100-night in-home trial. Nest Bedding Alexander Signature Luxury Firm mattresses are only available online or through Nest Bedding stores. Click here to check for a location near you.